Chris Ford, owner of Ford Companies, relies on his Cat® equipment to get the job done every day. From 2013, when the company was incorporated, Chris has been working with Gregory Poole for all his equipment needs. 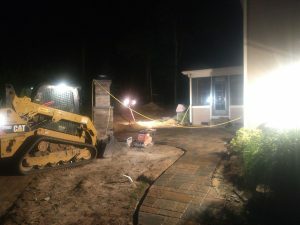 The first piece of equipment for Ford Companies was a Cat 257; Chris had been using Cat equipment with his previous employer, and knew that he wanted to continue to buy Cat with his own company. As someone who has been around Cat machines, Chris says that he will not be using anything else. 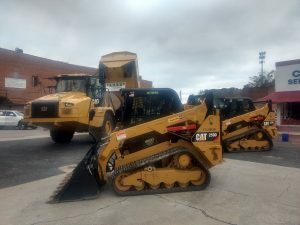 The service after the sale, the nicer equipment and the operator comfort have all been big reasons that Ford Companies will continue to work with Gregory Poole and keep buying Cat machines. Chris may have started the company with just him working alone, but he quickly started adding employees as the company continued to grow. In 2018, his wife Melanie came on board to manage the increasing office demands. Ford Companies currently employs around 36 full time employees. They are known for their jobs with landscape installations, hydro cutting, irrigation, clearing, hardscapes and more. Serving primarily Johnston, Wake, Franklin, Craven, Carteret, Orange, Chatham, Harnett and Wayne counties, the company keeps busy! Currently, some of the larger projects Ford Companies is involved with include new home construction, commercial street clearing, lot preparation for builders, and more. 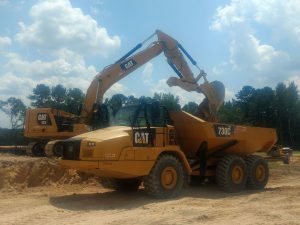 To help on these projects, the company has 6 Cat 259Ds at a time, all on 2-year lease, and they will rent anything else they need, including a 323 and 308 excavator, a D5 dozer, and a 730 articulated truck, from the Gregory Poole Cat Rental Store. 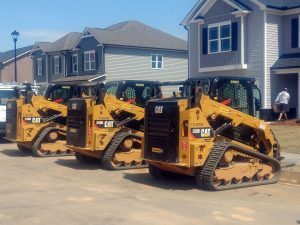 Chris Ford has become a big fan of the leasing program for his 259s, because he says his employees and he enjoy working with the new machines. This process also allows them the option to grow when they have the opportunity. One of the main reasons Chris relies on the leasing program is that the machines all still fall under the same 2-year warranty that you would get on these same size machines buying new. Ford Companies is also a big supporter of the local community. As a sponsor for the Junior Women’s League in Johnston County, they’ve been involved with the “Touch a Truck” event. Chris gave Jared Bauer at Gregory Poole a call to try and get a Cat 730 articulated truck for the event, and was pleased with the effort Jared put in to get that truck there. This type of partnership is why Chris and Ford Companies loves to work with Gregory Poole and trusts us with their business.